The Miller Law Firm provides compassionate counsel and aggressive representation to clients throughout Los Angeles and surrounding counties. The firm specializes in criminal defense and has a personal injury practice. 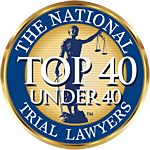 Dedicated to achieving each client’s specific goals, The Miller Law Firm has a reputation for personalized and effective representation. By strategically and aggressively approaching each case, the firm has successfully litigated a wide variety of criminal matters through jury verdict. The firm has an extensive criminal law practice and represents clients facing complex felonies to common misdemeanors and crimes, such as DUIs or DWIs. The Miller Law Firm also represents clients in personal injury cases to ensure they receive the settlement they deserve. Whether you’re facing criminal charges or were injured in an accident, The Miller Law Firm will fight for you in court and zealously protect your rights.